HOW TO BUILD SIMPLE TELEGRAPH SETS. I am often asked for help in building a working electric telegraph set for use in school projects or displays and demonstrations. I have tried to outline the process of building a simple set in the paragraphs below and I have included several variations as well as a simple wireless telegraph set. If you decide to build a telegraph set, I would particularly appreciate receiving photographs of your completed set and I will try to post some of them on this page for other "telegraph builders" to see. Many people have inquired about how to build a simple telegraph system to approximate the early systems used in the 19th century. As you can see, this was a carefully thought-out and executed project. Many people just want to build a very simple set to become familiar with the basic principles of the electric telegraph. The following project is the simplest functional telegraph system construction project that I could find. It requires very few parts and all of them should be commonly available. 9 Small wood screws or nails. 4 Flat strips of metal. Three of them should be about 4 inches long. One should be about 7 inches long and MUST be iron-bearing or "ferrous" metal which is metal that is attracted by a magnet. 20 ft or more of INSULATED solid wire. Construction of the telegraph set is very simple. Just look at the photographs and you will see how it is put together. Be careful not to cut yourself on the edges of the metal strips. If children will be using the set, you will want to round all sharp corners and perhaps put tape over any exposed sharp edges. The key:(14KB) is made by screwing one of the strips of metal to one of the pieces of wood so that pushing down on the strip brings the strip into electrical contact with the screw that is mounted under it. The Battery Holder:(14KB) is made by screwing two of the metal strips to the wood so that they can make electrical contact with each end of the lineup of the two batteries. A rubber-band may be used to maintain pressure on the battery contacts. The Sounder:(12KB) requires a bit of care in construction and adjustment. The longer iron-bearing strip of metal is screwed to the wooden base and bent so that it extends up and over the top of the nail. This piece has been labeled "IRON-BEARING" in the parts photograph to indicate that it is pulled in by the magnet. Many food cans are made of this type of metal. Be careful not to cut yourself on any sharp edges. The second nail is important because it keeps the strip of metal from pulling too far away from the electromagnet. It also serves to make a clicking sound when the strip of metal is released by the magnet and moves upward. You can learn to tell the difference between the dots and the dashes of the Morse code by learning to tell the difference between the pull-in "click" and the release-"clack". The pull-in "click" is the sound the metal strip makes when it is pulled in by the electromagnet coil and strikes the nail which is in the center of the coil. The release "clack" is the sound that the metal strip makes when it is no longer pulled by the electromagnet coil and it moves rapidly upward to strike the upper nail. It was made by 13 year-old Claire Berry in KwaZulu-Natal, South Africa. It won a high grade in a science project. 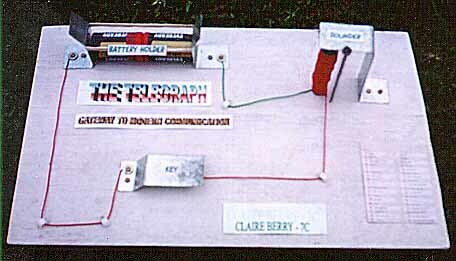 Simply connect the key, batteries, and sounder with wires as shown in the first picture. Pressing the telegraph key completes the electrical circuit and allows electricity from the battery to flow through the sounder's coil and it makes a clicking sound as the metal strip strikes the nail in the center of the coil. 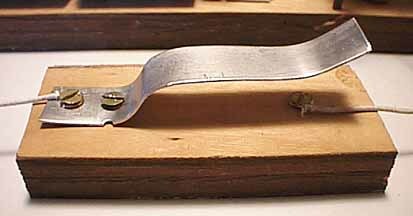 Releasing the telegraph key allows the metal strip to spring upwards and strike the other nail, making a different click. You may use up to 100 feet of wire between the key and the sounder. Please be careful not to hurt yourself while building this set. The improper use of tools during construction can cause serious injury. The original designer of the set and the maintainer of this web page accept no liability for injuries caused by the construction or operation of the set. The components are all in what is called a 'series circuit'. When the key is closed, the electricity flows in 'series' from the battery through the closed key to the sounder and through the sounder coil back to the other terminal on the battery. or even in the middle.
! SET 1. Set 2.   ! Here is another circuit which was designed by Bill Horne, W1AC. without the need to close the circuit closing switches on the keys. the POSITIVE (+) and NEGATIVE (-) Terminals as shown. NOTE: It is also IMPORTANT to use the same voltage..
( ..for example, 2 D-cell batteries.. ) for each battery. "I built a prototype using two strips of sheet metal screwed down to a piece of wood for the switch or key to switch the electricity on or off." 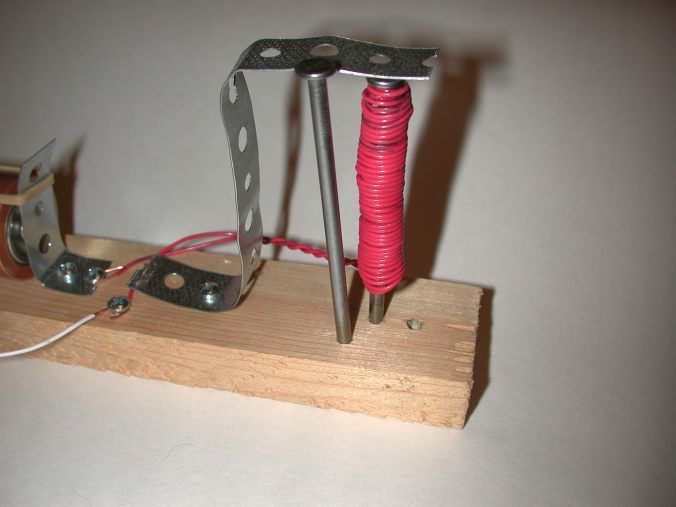 "I used a nail as the core of my electromagnet and I wound 100 turns of insulated wire around the nail. I mounted the nail so that it would attract a piece of springy iron when it was activated. 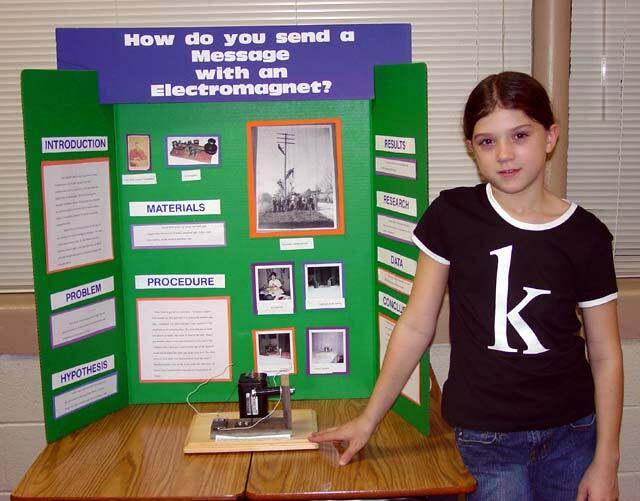 (at first, I used a piece of aluminum or copper metal and discovered that the metal had to be iron or ferrous metal for the magnet to be able to pull on it)." "I connected them all as in your diagram and used a battery holder and two "D" size flashlight batteries to provide the voltage." "When I push the key, it brings the two pieces of metal together and completes the electrical circuit. The electromagnet then pulls in the piece of springy iron and it makes a nice click." 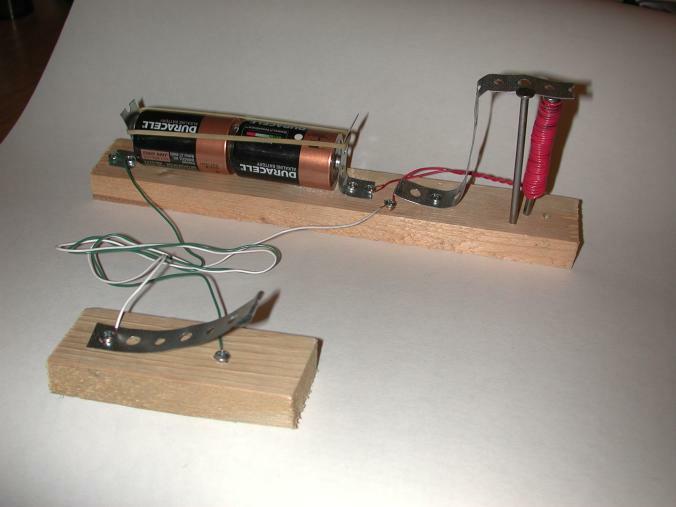 "I built another prototype hooking a buzzer to the circuit instead of the sounder. That took care of the problem of telling the difference between a dot and a dash, but it isn't much of a challenge or learning experience for the kids." "Any help or suggestions would be appreciated." What a great project! Congratulations on creating a working system like that... Yes, It is easier to have the kids learn to use a buzzer than to use a clicking "sounder". A doorbell buzzer, available in hardware stores approximates the early buzzer sounds quite well. 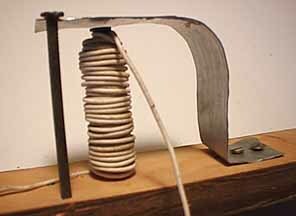 The sounders used from 1850-1950 were like your nail/solenoid.... IF... you were to modify it by putting a piece of metal OVER the piece of sheet metal that is moved by the electromagnet. 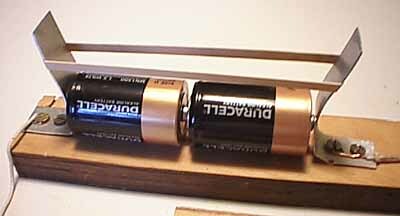 This would give you a system that made a click when the electromagnet pulled IN and a slightly different clack when the electromagnet released. Sounders all make a slightly different sound when they pull-in rather than release and the operator learns to discriminate between these two different sounds and soon unconsciously can tell a dot from a dash. That might be a bit of a challenge for your kids to learn so you might want to go to the buzzer system used from about 1910 to 1950. You could also try using very different metal parts to strike on the pull-in and release to make the sound difference even more noticeable. You could also use a light bulb as an adjunct to the sounder and have it go on whenever the sounder was activated. This might help the kids learn to copy the code. You could also mount a pencil on the sounder arm and have it mark a piece of paper with either a high mark or a low mark while the paper was pulled under the pencil at an approximately constant speed. This would approximate Samual Morse's very first telegraph systems used before people learned to copy code by ear. 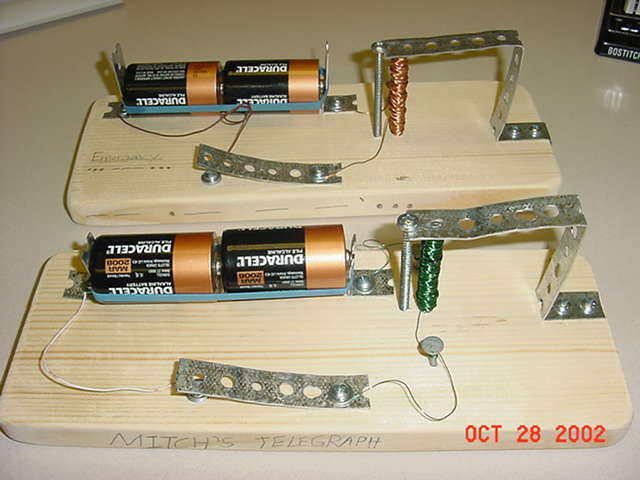 Morse invented a "register" which used a clockwork mechanism to pull a paper tape under a pencil which was moved in and out by an electromagnet. One parent emailed that all his completed set did was to have the coil of wire get very hot and that the battery went dead shortly afterwards. After asking him a few questions, I found out that he had wound bare (uninsulated) wire around the nail. I explained that the coil of wire had to be made from insulated wire so that the individual turns in the coil did not electrically connect to each other. One parent noted that closing the key caused the electromagnet to attract the metal armiture of the sounder but that it did not release after the circuit was opened. INSERTING a very thin piece of plastic sheeting or wrapping materal between the nail and the armiture to prevent the metal armiture from directly coming into contact with the nail.